I have a dream. A dream where my smartphone is my computer, my work horse. Within 10 seconds and almost zero preparation I want it to deliver me a big screened, QWERTY keyboarded experience. Continuum is one way to go, but we don't yet have the HP Lap Dock, plus that's going to be quite expensive and heavy/bulky, i.e. it won't fit in any pocket. 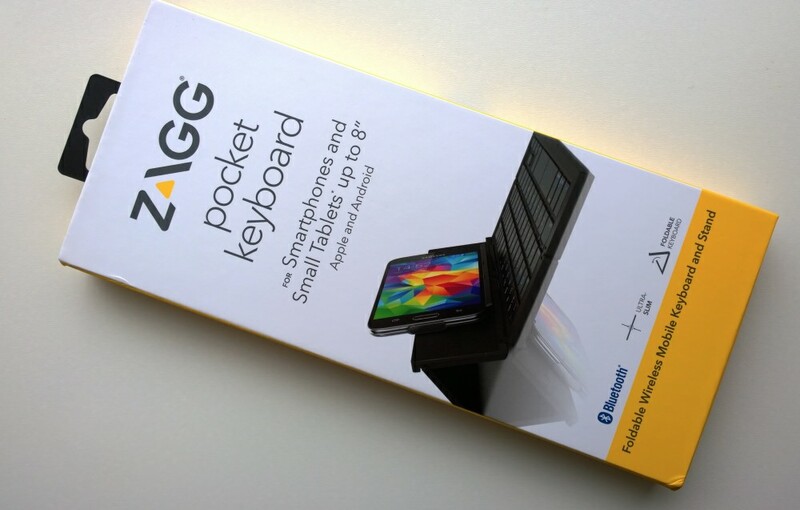 The ZAGG Pocket Keyboard does, it's £60 (or less) and I'm writing this review on it. In my car, while waiting for family, with almost no preparation needed. We've had Bluetooth keyboards for years, of course. The concept hasn't really changed much - they're fragile things with multiple hinges and ribbon cables. But the models and manufacturers don't seem to stick around for long, unfortunately. ZAGG stands a chance of doing better, plus its implementation is one of the best I've seen. Foldabiity - the closed unit needs to fit in any pocket, ideally you'd forget that it's there. 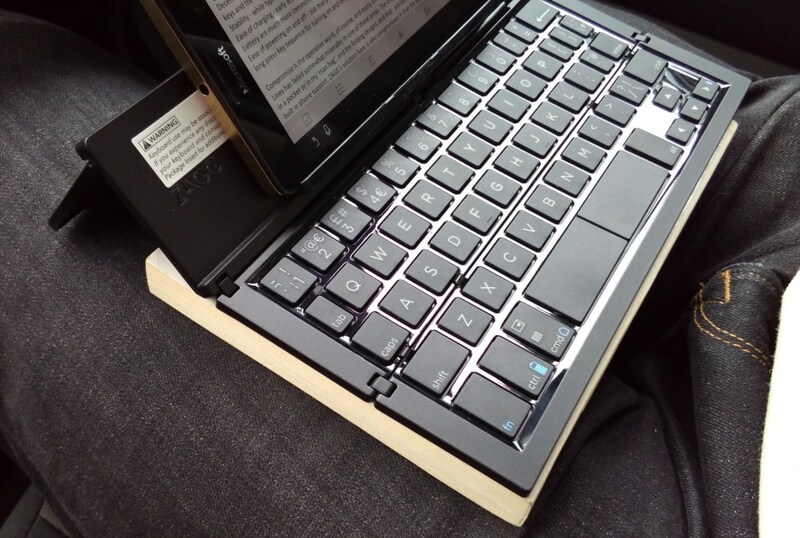 Physical support for the device - the phablet or tablet being typed into needs to be propped up at a decent angle, and securely, so that you can see what's being typed. Well, partly, that and the propping up generates a holistic sense that you are, in fact, using a laptop. 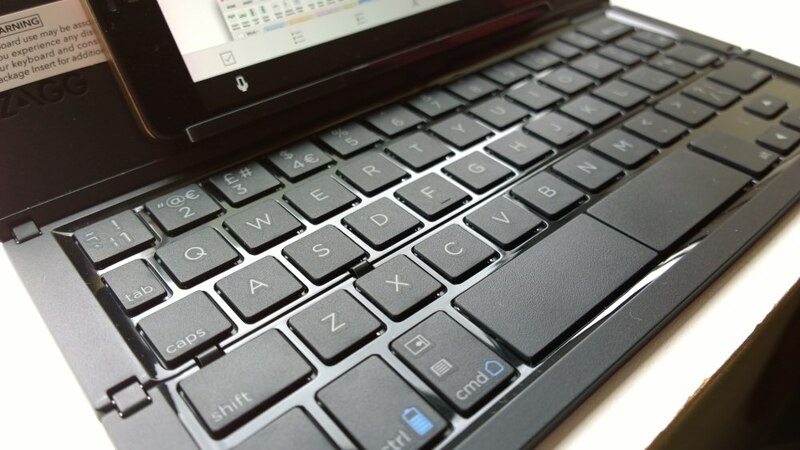 Decent key size and travel - this is always going to be something of a compromise, but the larger the keys and the further they travel, the closer you'll be getting to a 'laptop' experience. Stability - while typing, the keyboard shouldn't move or bounce around unduly. Ease of charging - early accessories used AAA batteries, but these days microUSB and a sealed Li-Ion battery are much more common. Ease of powering on and off - too many designs in the past have required me to remember the exact long press key sequence for turning on and off, or for pairing. Compromise is the operative word, of course, and every solution I've ever tried along these lines has failed somewhat miserably in one of these areas. The one piece designs are too large to fit in a pocket or in my 'man bag', and the folding designs often don't have any built in phone support. My previous old-time favourite was Nokia's SU-8W, but this hasn't been available for years, offered poor device (physical) support and I doubt it would be fully compatible with today's phones. 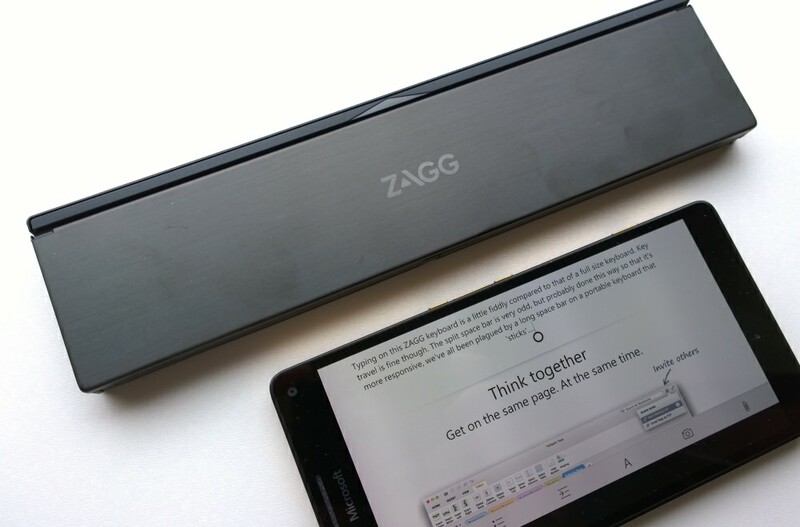 ZAGG's solution here is also compromised in that the keyboard does flex a bit while typing and that the opened up keyboard really needs a book or other solid surface to rest on, but otherwise it gets closer to any other solution to fulfilling all the requirements above. It all starts with the size when folded though. 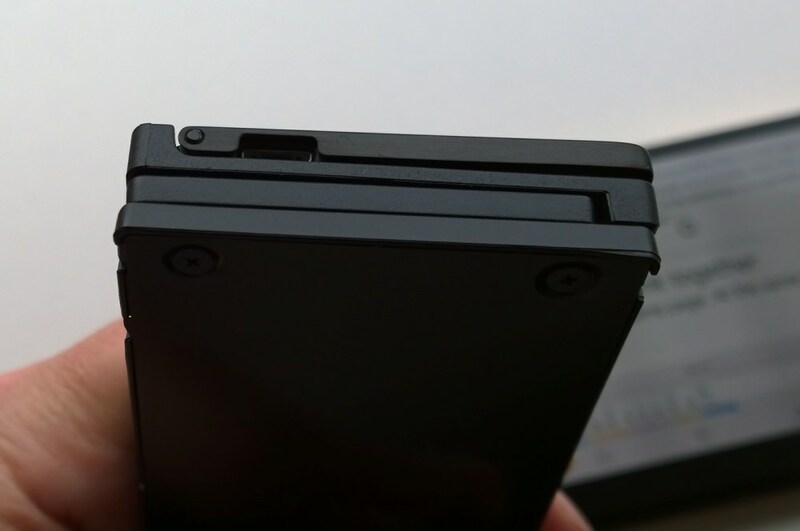 The horizontal fold within the keyboard means that the accessory can become long and thin rather than square, as is the case with a vertical fold. Together with a QWERTY key matrix that's around 80% full size, the folded unit here can genuinely fit in any jacket pocket (if not trousers) or small gadget bag. The materials used are plastic throughout, to keep the weight down - there's a little too much flex to the main keyboard section though and I'd have liked to have seen thicker plastic or even aluminium here. 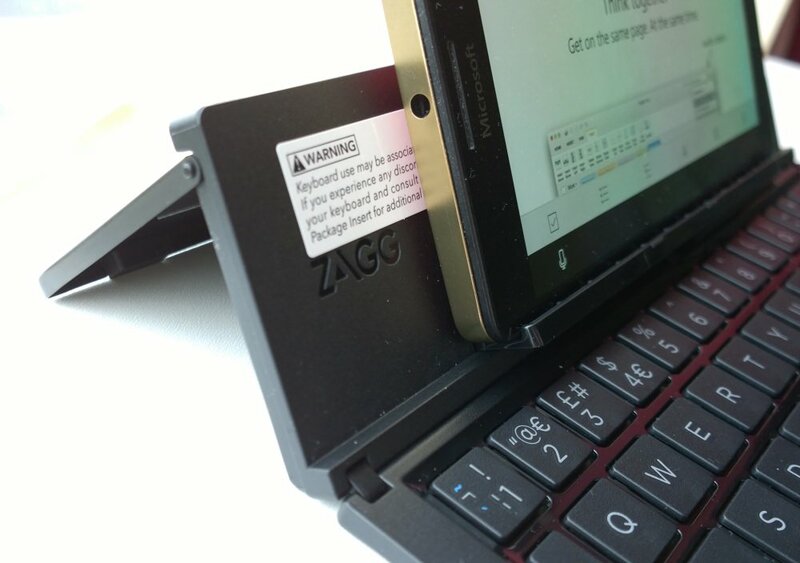 The electronics, battery and power LED are all in the slightly thicker top section (with the ZAGG logo on it), with a fold-down kick stand at the back and with the two hinged keyboard sections connected up with no less than five ribbon cables of various widths. Ribbon cables can be a weak point in the mobile world - just ask anyone who had a Psion palmtop in the 1990s - but in this case the accessory is only going to be used, say, a couple of times a week, rather than 50 times a day (as in the case of the Psion), so I'm sure the ribbon cable flex/wear won't be an issue. The key layout is a full five rows, though without any extras - so no page up or down, media control, and so on. Which is perfectly fine - the screen of, in this case, my Lumia 950XL is only a few inches away and propped up for easy tapping. The Ctrl and shift keys work for the usual selection, copying and pasting actions, so I'm happy. The space bar, oddly, is divided into two, but this seems to just be to improve the response - a longer key, allied to the flexing of the keyboard plane, might have led to the typical 'stuck' space bar that most of us have been plagued with at one time or another. 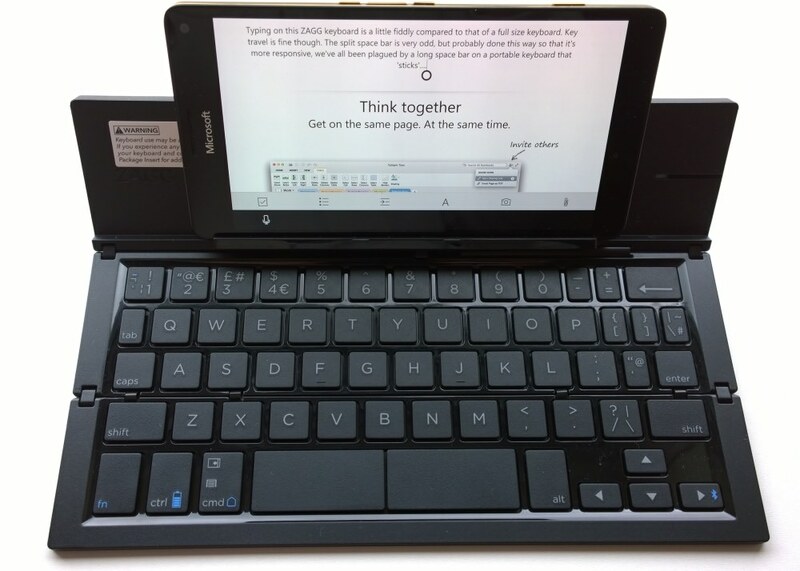 In terms of typing, the reduction to about 80% normal key pitch (14cm from Q to P on the top row) does have an impact in terms of speed, though this is balanced to some degree by the auto-text-correction built into Windows 10 Mobile and almost all other smartphone systems these days. So simple typos get ironed out automatically - in typing this review, I'd average about two mistakes per line and the majority of these were caught and corrected by the OS. I was typing into OneNote, but the same should apply to any other text-based application - certainly Windows 10's handling of Bluetooth keyboards is pretty good. I did have to tap on 'Back' after going into the application, to initially clear the on-screen keyboard, but after that the only on-screen editing elements were auto-correction suggestions and a microphone should I want to try voice input! Power is handled elegantly on the ZAGG Pocket Keyboard - when you close the accessory up, magnets hold it closed and also shut the electronics down. Then, when you open the keyboard up again later on, the magnets detect this and power the keyboard on (you know this because the LED briefly shines green). The finish on the outside is 'brushed metal effect' and certainly looks like a serious bit of kit. It's relatively light too, at under 200g, thanks to the use of plastic. I can't comment on battery life, since it's still on its first full charge, many hours after starting to use it - Bluetooth keyboards are usually pretty frugal with power though and I'd estimate somewhere around 20 hours of use per charge. Which, for most of us, may work out to 'charge it once a month'. Although not perfect, of all the Bluetooth keyboards I've tried, the Zagg Pocket Keyboard comes closest to helping me achieve true writer's mobility when out and about. From typing to compactness to physical support, this takes some beating - and it's earned a permanent place in my over-the-shoulder man-bag.